As a Career Coach and Vocational Evaluator you may think that I was one of those people who I’ve always envied, those who knew exactly what they wanted to do when they grew up. They would apply to the college that offered the program they knew they wanted to study. After college they’d go straight to graduate or professional school and then start a job. On the contrary, I took the long route to finding my perfect career. I went to an art college because I loved art, but not with a real end goal in mind. I applied to graduate school, but decided to defer a year, which turned into 15 years. I took the career path of trial and error. I worked in retail, first in a clothing department and then transferring to the makeup department. Makeup was enjoyable, but sales were not my thing, so I took a job as a traveling makeup artist, but did not enjoy the long hours in the car and being stuck in traffic. I apprenticed as a cosmetologist and really liked working in a salon, but after the birth of my first daughter the long weekend hours were tough. All of my experiences helped me to figure out what I liked and didn’t like about the world of work. Fortunately, the years of experimenting ended up well and I now have a career that I love, but it took me a little longer to get to this place than it needed to. I ended up in my field through a happy accident. A friend who was a Career Assessment Consultant told me about her job and it seemed like a really interesting field. She was moving away and her position became available right at the time I was ready to go back to work after staying home to raise my children when they were very young. I observed my friend and knew this was the job for me. That job has turned a career that I enjoy and feel good about. 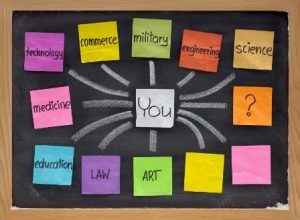 While for me this method of arriving at an appropriate career path was ultimately successful, there is a much easier and more effective way of planning your career path! Here are some steps to help you do this successfully. Get a career assessment. This is a process that includes a variety of evaluations and career explorations to help you plan your career. Assessments can be done in person by a career coach and online (for example, www.gatewaytocareers.com). Do online research to find out what careers are growing, for example, www.careerinfonet.com and www.onet.com. To learn more, also read Are You Ready? Careers of the Future by Ronnie Green. Talk to friends and family and list careers that attract you, as well as parts of jobs that you find interesting. Ask people you know who work in these fields if you can spend some time observing or shadowing them at work. Visit websites to watch videos about a variety of jobs, such as www.careerinfonet.com and www.youtube.com. When researching careers, keep your everyday interests in mind. Research shows that people who enter careers in keeping with their interests are more successful in their jobs. Identify your transferable skills, i.e., skills that you have learned in a job, volunteer position, internship, school, or daily life that can transition into another position. Look at the schooling and training needed to enter the field and decide how much time and money you want to spend becoming educated before going to work. Planning your job search and directing it towards your end goal streamlines the process, saving you time, energy, frustration, and dead ends. It also makes you more motivated, confident, and more likely to find a job that is a good fit for you. Call 410-466-9200 or visit www.jcsbaltimore.org/job-seeking to find out how the JCS Career Center can help you plan your career path. I loved reading about your story and how you arrived at your career destination! Really enjoyed your blog. I think that many job seekers will find your advice and story encouraging.